This is part 10 of a 10-part series. All of the alums who helped out with our stack. All of the Caltech personnel that let us use various spaces and things they were responsible for. Everyone who went on the stack! I’d go into specifics, but I’m sure I’d miss someone. The highlight reel is mostly video footage I’ve posted elsewhere in this series with a little bit of extra footage that didn’t really fit anywhere on its own. I hope it provides a good summary of the day and memory store for everyone who was involved 🙂 It’s…kind of long. Now that I’m done with the Ditch Day series, I guess I’ll need to find new things to write about! Hopefully, I’ll be able to write a few essays touching on software engineering, music, e-sports, or other interests that I have. If there’s any interest, I might write another post with advice for next year’s seniors from someone who has now been on both the senior and alum side of things. For the next little bit, I’ll probably focus on my next reading project, though, as I’ve been devoting all of my time to writing the blog and have let some other projects slip. As far as Ditch Day, I enjoyed helping out where I could when I came back this year and am looking forward to doing so again next year. In a broader sense, I think life would be a lot more exciting if we made activities as elaborate as these just so that people could have fun with them. Maybe I should look into trying to make that happen out in the real world. As a sort of below the fold shameless plug: I’m doing a bike ride this fall to help raise funds for a charity that supports MS research. Please consider giving a tax-deductible contribution here and check out both my and my team’s progress here. This is part 9 of a 10-part series. As I mentioned at the end of part 5, the Space Alert puzzle led directly into the grand finale. As soon as the frosh completed the puzzle, an alarm sounded and the giant crane in that space began rising, revealing the supercomputing core in a container made of mylar. The core itself was made out of a glass bottle filled with some flammable liquid (alcohol? acetone? I can’t remember). Just as the group removed the core from its location, two alums (Daniel and Ryan) appeared on a catwalk above them, and yelled “What are you doing? Stop!” At that point, Kurt yelled “run!” and took the group through a back room in the building. The room was already filled with vaguely science-looking things (it being a physics lab and all), but we arranged them to force the group to take a somewhat circuitous path around the room. We also added a few extra touches: a spinning red siren light (like this one), a blacklight, and a semi-transparent plastic sheet that we turned into a wall and on which we painted the Vector logo in a paint that would glow under blacklight. When they left that room, the group had to go through a circular tunnel and climb up a set of stairs that took them to a familiar location outside, through a door they likely never even noticed. We actually didn’t know about the existence of this room or the tunnel when we asked for the space in which we were building the Space Alert puzzle. One day, Matt came to Jeff and me and said “you guys have to see this.” We walked to the area and Matt took us to the back room. As we saw the room, and especially the tunnel with its exit, our minds were fairly blown. We knew we had to use it, but didn’t have any good ideas for how to use it until we realized that the beginning of our grand finale could be an awesome chase scene. When the frosh finally made their way to Blacker courtyard, they found a small “furnace” in the middle. This was where they disposed of the supercomputing core, a la Portal. The frosh got their final message on the AI and the day concluded. I had to take some video of the escape tunnel myself, since they were too busy running to record. The next post will be the last! I will be posting the highlight reel of all the video footage I have. This is part 8 of a 10-part series. Before I talk about the finale and make the video highlight reel, I want to tell a few stories about the planning, building, testing, and deploying of the stack. I wish I could tell you about all of the little experiences I had while doing so, but that would make an already long post even longer, so I’ll try to tell the most relevant pieces. The stack design all began on the night before a fake stack sometime second term. We were out getting some delicious late night LA food after having finished our fake, and on the way there we confirmed that the three of us were working together. I proposed that our stack theme should be an original content time travel stack, and I think we all pretty much agreed at that point, since nobody had a strong opinion on something else they wanted. I had actually discussed how cool it would be to have a time travel-based stack with Matt a few years beforehand, so I was glad that the idea was getting implemented. Then, we discussed how we wanted our stack to be flavored. Time travel could imply visiting historical events, or it could be a science fiction stack like ours. We chose the latter because we felt it would be more compelling to our target audience, as well as because it’d be kind of annoying to have to research historical events in addition to coming up with a good plot. Once we decided on a more sci-fi flavor, one of us (probably Matt) came up with the idea that it should be set at Caltech in the future. It seems like it might be a cheap cop-out, but I think it served to help the immersion without losing much. Our remaining design challenges fell into two categories: plot and stack elements, the former being somewhat uncharted territory for us and people we knew. We spent months making regular trips to my room to have a “nice refreshing soda” (after our on-campus convenience store runs), where we sat in front of a Google doc that went from being a bullet-pointed list of things we needed to do to just a disorganized mind dump of stuff. Somehow this never really became a problem; I guess ctrl+f is a powerful thing. I don’t remember much about how the plot developed. I think it sort of organically grew as the three of us contributed ideas. Matt is a pretty gifted story-maker, so his contribution was definitely quite valuable. Much of our time was spent debating details of our story and whether they were internally consistent. For the stack elements, we had already developed some ideas for our bigger mainstays while we were underclassmen (definitely we came into the design process of the stack already having the preliminary ideas for what later became the mirror maze and the Space Alert puzzle). For the rest, we wanted to balance puzzles with activities (and, where possible, combine the two), as well as including at least one brute force element just for tradition’s sake. That’s how the minor puzzles came about: we just ran with some of our one-off ideas to balance out the stack and fill out the day. We did actually wind up having to cut one of the puzzles that we developed, which would have involved something to do with pinballs rolling around in multi-layered mazes that you controlled by tilting the entire structure. The horrible mess of cables that threatened to take over my room entirely during the build process. When we actually got around to writing the detailed parts of our stack, including timings, we had to follow the advice given to everyone, which is that frosh are kind of dumb. A more charitable way to put that might be that it is difficult to gauge the difficulty of puzzles, even with play-testing by alums, when they’re developed in secret. The stack that I went on my frosh year created a slight workaround for this problem (I don’t know if they got it from anywhere). They made their puzzles a little bit on the hard side and included several envelopes with each puzzle with notes that said “open if still working at [time],” each of which offered successively more explicit hints, the last of which offered the answer to the puzzle. The reason they were made to be harder is that having a stack go too fast is pretty poor as well, as they need to be stalled with other puzzles (sometimes “best-of” puzzles from other stacks that are resettable) to fill out their day. We used this idea, albeit digitally, and it seemed to work out pretty well: our stack was actually almost exactly on time for at least half of the day. A large part of building our stack was making sure that other people would be able to actually solve any of the puzzles, even if we did tweak the difficulty up. After all, much of engineering is about coming up with an idea and then iterating. Our progression was mostly to try it ourselves, then test it with each other, as much as possible, and finally test it with a group of alums. Sometimes a lot of changes happened during testing: the mirror maze got a few tweaks to difficulty and correctness with alum play-testing (I had a bug where holding down a button would cause the input to freeze for a while as the buffer cleared, so I put out instructions not to hold down buttons), the Skype puzzle developed from Matt’s original form to its final form over the course of a run-through or two with Jeff and me and later some other seniors, and the wire puzzle was completely redesigned when alum play-testing showed that its original form was kind of crap. It’s interesting to think back to this process, because it almost feels like we were doing UX design (certainly not something I’m good at), as we were testing how people would interface with our puzzles, and what was confusing or unsatisfying about the experience. I felt like lord of the monitors when I still had the mirror maze controlling computer in my room. Of course, sometimes testing it had to sort of wait until the last moment. The only people around on campus who can test your puzzles are other seniors, and they’re often busy with their own stacks. The alums are very useful for this, but they only show up for the week before. That’s why much of the week before our stack was spent testing (thankfully we had the puzzles built in time). I would definitely advise any seniors reading this to build their stacks in time for alums to be able to run through it at least once. In addition to lack of QA manpower, many of our stack components were built in our rooms and couldn’t be moved on-site until the night before (since we didn’t have access to the spaces until then). Thus, we were forced to do some creative limited testing in our rooms. At least we were seniors, so we had the bigger rooms! 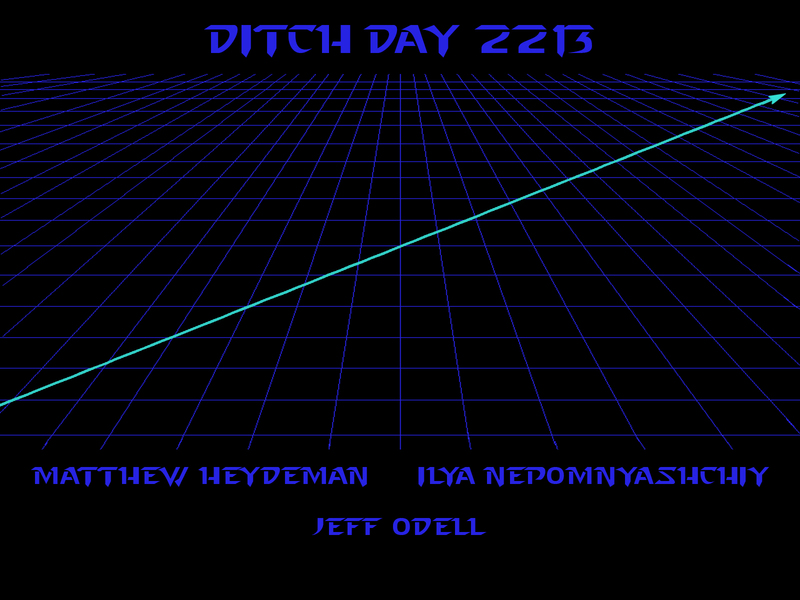 Ditch Day stacks are almost entirely self-funded, and ours was not cheap. Looking at our budget, it looks like we spent about $1900 total on the stack. The biggest expenditures were the $600-800 on the mirror maze (we spent $370 on mylar and about $185 for arcade buttons and controllers, though some of both were also used on the Space Alert Puzzle) and the ~$400 we spent on our shirts from CustomInk (for a total of 18 shirts: 12 for the stackers, 3 for us, and 3 for alums who helped a lot). As I’ve mentioned before, the tablet was only $55, which was awesome. Some entries in our budget include “Ilya likes scotch” (Scotch Tape), “My(b|l)ar Part 2” (our second purchase of mylar — I think this was a reference to the Electric Six song “Gay bar Part Two” somehow), and “2800 feet of 32 gauge mag wire” (that one’s exactly what it sounds like). While dealing with the mylar, we often called it the “mylarium invectus domine”, mostly because we were sleep deprived and thought it sounded funny. The fact that the final code to the mirror maze was “MID715” was a callback to this that only we understood. Fortunately for us, we managed to get a little bit of help with the money side of things. First of all, Blacker Hovse subsidized some of the cost of Ditch Day stacks, depending on how many spots were on the stack. The amount of the subsidy that my stack received was about $400. Furthermore, at the end of the year, the seniors hold a “garage sale”, in which they try to pawn their (sometimes useless) Ditch Day leftovers on the underclassmen. My stack managed to sell off about $420 worth of stuff this way. Thus, at the end of the day, we wound up spending about $1500 on the stack, which was “only” about $500 per person building the stack. Overall, it is very much the case that more money does not make for a better stack and vice versa. We spent a lot of money because we were ambitious about the scale of our construction and at least partially because we were kind of lazy about shirts (which we’d still probably have to spend ~$150-200 on if we screened our own). However, other stacks in Blacker barely spent any money at all and received positive reviews. It really depends on your vision for the stack and what kind of flavor you want it to have. I’m grateful that my fellow stackers and I were willing and able to spend so much money! Our stack was quite perfectly timed in the morning. If I remember correctly, they were solving and arriving at puzzles within minutes of our schedule. This was, of course, helped a lot by our ‘clue envelopes’ and the fact that the people on the stack diligently used them when needed (which I don’t think was that often). At lunch, we were quite optimistic about our stack actually working out. There was one exception, which was the fact that our stack thought the mirror maze was broken for some reason when it wasn’t. I think it had to do with their accidentally muting one of the speakers. After lunch, Jeff and I cloak-and-daggered on-campus in the hopes that we could fix it so that our stack could do it at the end of the day (we found nothing broken, by the way). On the way back from that, we almost got duct taped to a tree by some underclassmen, but Jeff’s and my sprinting in flip-flops skills and the underclassmen’s apathy skills won the day. The afternoon was a completely different story. It started off pretty uneventful, but we were soon getting reports that our stack was skipping elements (maybe the tying up of Kurt, maybe the wire puzzle sabotage, maybe something else?). I tried sending some messages over the tablet app to not skip things but it didn’t seem to be reaching them. More reports seemed to come in to confirm this news. A combination of confusion and sleep deprivation resulted in my getting very angry and frustrated, as I was worried that they were ignoring the plot, which was a pretty major component of the stack. I worried that this meant they would have hated the experience because of that. Other alums and seniors were trying to calm me down while I tried to take some deep breaths and see where the frosh wound up. It was overall a very stressful hour or so — it isn’t a fun feeling worrying that months of effort had gotten wasted. In the end, it turned out that the frosh had just decided to split up to do the sabotage portion of the stack and completed it quite a bit sooner than expected, which was the cause of our faulty intelligence. Thus, it wasn’t the case that they missed fairly significant chunks of the plot. I calmed down quite a bit after hearing the corrected news, although apparently the news that I was very unhappy filtered through to the frosh when they decided to prank our rooms after getting done, so they skipped mine. I feel sort of bad for that. When Ditch Day was over, we got to see the people who went on our stack and talk to them. That is when I found out that they had mostly positive things to say about the stack, which made me quite happy. I even had a junior tell me that it was the best stack he had been on. Thankfully, I got to end the day feeling that my stackmates and I had done a very good job, and we had a few days before our required clean-up to run our biggest puzzles for more people in the house! This is part 6 of a 10-part series. Last time, I covered the second of our two largest undertakings as far as puzzles on my stack. This time, I’ll cover three of our less complex puzzles. But first, an update! I finally got a hold of a video of our dinner announcements from the night before Ditch Day, so I put that video up back on part 2. It contains my stack’s announcements plus a few more that I added just because I felt like they helped give a good example of what announcements are like in Blacker. The frosh learn that the access codes to various Vector time machines were changed without authorization and that Vector believes their stacking senior potentially left the codes in a puzzle that had to be abandoned. They proceeded to the North end of the old Y building and walked in to discover a well-lit area with three rooms, each of which contained a box fan. Each fan was numbered and had one side’s cover taken off. Otherwise, not much else was apparent about the fan. But wait! One of the rooms had a strobe light in it and the lights off. 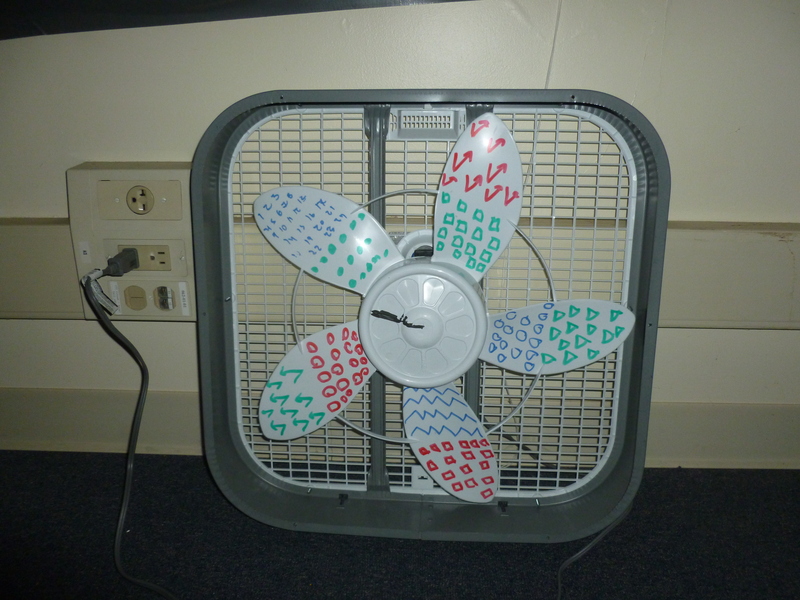 Bringing the strobe light and the fan together allowed them to freeze the fan blades in place. They found that there were weird symbols on each of the fan blades. Somewhere else in the area (which contained about four rooms), there was a key which correlated color and shape to a letter, as well as a pictorial description of what order to read the blades in. Best song to play when strobe lights are playing. Also, this blog post best read while listening to this song. Since every good Ditch Day stack ought to have a brute force component, we hid two more strobe lights behind a closed and locked door and left a sledgehammer suggestively placed next to the door with a note that said “Note to self: Make sure to leave sledgehammers for brute force component” on the door. Since this was supposed to be part of the disappeared stacking Senior’s stack, this sort of fit into the theme of exploring the unfinished portions of a stack. It was okay to destroy the door since the Old Y building was theoretically slated for demolition. There were two unfortunate realities of this part, though. First of all, they didn’t have to destroy the door because it just opened with a kick. Moreover, the additional strobe lights didn’t wind up being needed: we originally designed the puzzle with colored symbols on the fan blades and put colored filters on the strobe lights, hoping that only one color would be legible with each light. Sadly, all the symbols were visible with all the lights, so the puzzle wound up being a bit easier than expected. One of the fans. Photo courtesy of Moya Chen. The final password wound up being ‘941fjmbew3pgkd526isclzqyah7v8t’ . An advantage of using the tablet was that we could make the passwords random strings and prevent meta-gaming the answer (oh, we have “B_ckman”. The answer must be Beckman!) but the downside was that there wasn’t really any sort of error-checking built-in. During the course of the puzzle, the group read “iscl” as “i5cl” (partially because I hand-wrote the key, oops!) and we had to send them some real-time messages over the tablet to correct them. I think I had to actually make the messages make some noises in order to get them to notice. Word of caution: Lots of strobe / flashy light footage. Don’t watch if that’ll make you sad. This one is one of my favorite parts of the stack. The frosh were sent to Beckman Institute to access confidential Vector files, which anyone in the Caltech community is allowed to view, but nobody is allowed to bring out of the building. Furthermore, the decryption process would take a while, so the two groups were ordered to split into two different rooms. In designing this activity, I started with the idea that I wanted a puzzle that forced the stack into two groups in separate rooms connected by a Skype call. 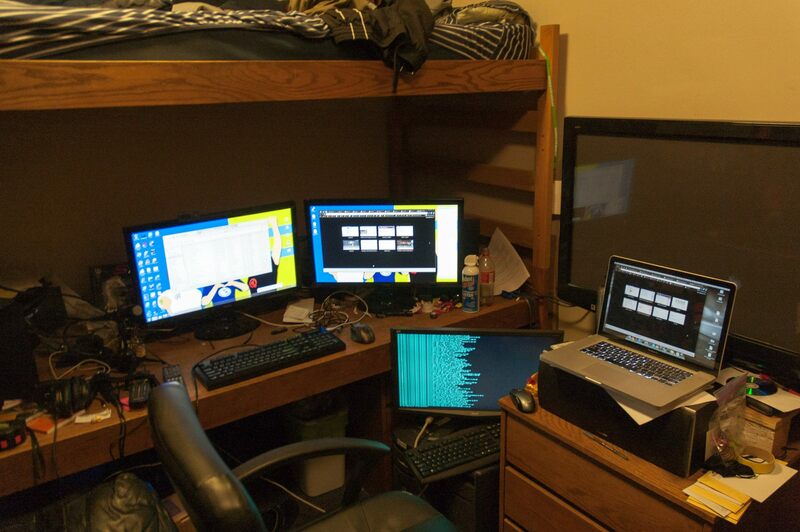 I went through a few ideas, including having two rooms each with five computers and having each member of the stack doing something on each of the interacting terminals (would have been really cool), or having some sort of big electronic display in both rooms that the frosh would have to interact with. This is one of the few ideas I had that I was forced to mentally scale back, since it was getting pretty unrealistic and we were already taking on two major projects. The tricky part was coming up with a puzzle where the groups would have asymmetric information but couldn’t just easily relay the entire puzzle to one room and have that room solve it. I’m not convinced we 100% hit that goal, but it still turned out pretty well. The fundamental idea for how the puzzle turned out came from Matt. His inspiration was from some subfield of Physics (can’t remember which) and dual latices. One group was given a circle with three annuli cut into wedges that had binary values in some of them. The other group was given a grid with binary values in some of the squares. The number of wedges in each annulus of the circle was equal to the number of vertices in the corresponding ring (out from the vertices surrounding the center square) of the grid. The frosh needed to figure out this correspondence, figure out that the value in a grid space was equal to the Z2 sum of the vertices surrounding it, communicate the values across the call (we told them no video — sending video over a temporal link is expensive! ), and find the vertices that are unambiguously determined to get the clue. Matt’s original idea involved two dual grids, but at some point during play-testing we decided to change one of them to rings. I think it was in order to hint more strongly at the correspondence. One of the groups at work. Forgive the crappy quality — I had to take a screenshot of the video. The green is what was provided, the rest was what the group drew. 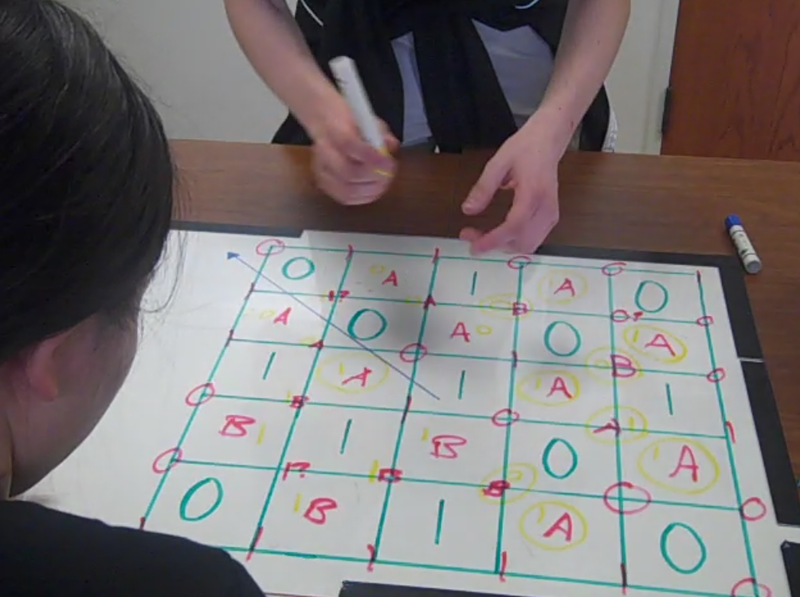 The puzzle was presented on a whiteboard with acrylic glass attached to the front. The unchanging parts of the puzzle were on the whiteboard itself, and the glass prevented erasing of those parts. The glass allowed them to write guesses and other information on top without screwing with the puzzle itself. We decided to do it this way mostly because it looked nicer than just using a whiteboard and permanent markers and partly because we had the time to do so! One of the nice parts of having the puzzle occur over Skype is that we got to listen in from our undisclosed off-campus location. It was pretty amusing (and frustrating!) to listen to them work through the puzzle. My favorite part was when they began just reading off portions of the puzzle and it sounded like some weird code, as they were just reading off 0s and 1s! 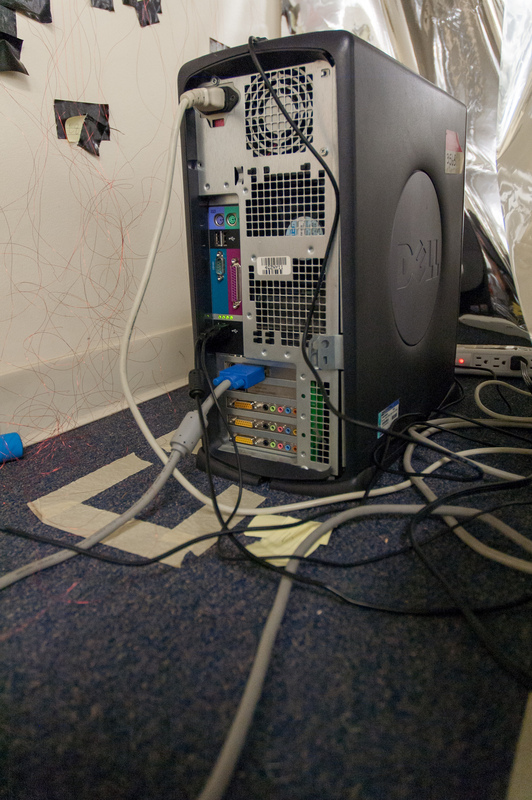 Afterwards, they got access to a flash drive and some string and told to get it out of the building. However, they couldn’t take it through the front door, as there were guards blocking the way to the front entrance (thanks Keven and Isaac for doing an amazing job — even asking to check the group’s student IDs). Thus, they had to get to the roof and smuggle it down to the ground somehow. For this puzzle, I want to give a shout-out to the person in charge of allowing people to use rooms in BI. He gave us full access to the room starting the night before, including giving us keys to the room for no other reason than that we wanted it for a stack. Yet another example of the honor code at work! The frosh, having recently completed their hand-off of the valuable flash drive that they smuggled out of Beckman to a Vector agent (Kurt), are told that they must proceed to SAC 15 to make their next jump in time. 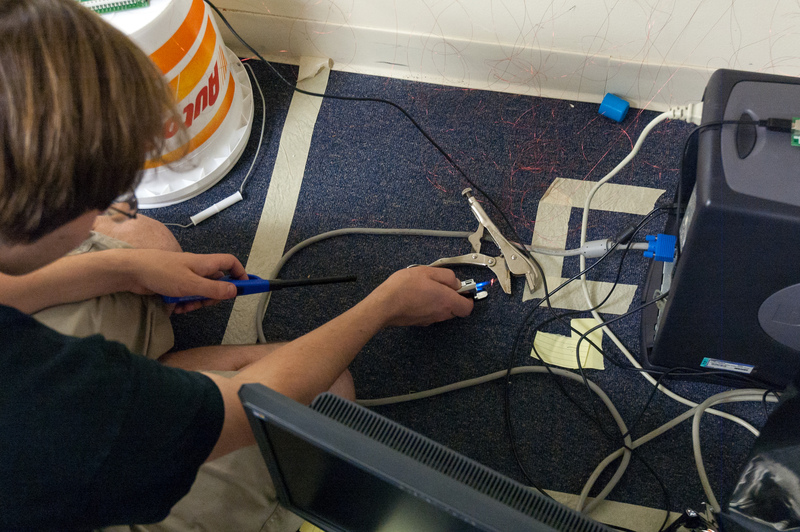 However, when they enter the room, they find that the “high conductance nylon” (translation: string, because we were a bit too budget constrained to use real wire for this puzzle) wiring in the location has been sabotaged! They had to re-wire the room before they could make their next jump. To be honest, this one puzzle is the reason I’ve been putting off this post for so long. I think the initial form of this puzzle was Jeff’s idea and was executed by him, and the final form of the puzzle was created by Suzanne (Jeff’s girlfriend / Blacker alum) after some play-testing. The general idea was to have a puzzle that was difficult to do because completing it involved creating obstacles for yourself around the room. The video didn’t really demonstrate too much of the puzzle — I’ll leave it for the big compilation at the end! Next time, which should hopefully be sooner than five months from now (given my goal of completing this series before the next Ditch Day, which is Tomorrow of course), I’ll discuss some more of the smaller components of our stack, including starting into some of our logistical issues. I’ll also have some fun trying to decipher what I meant when I originally wrote the title for that post. This is part 5 of a 10-part series. Since the last time I posted, I have gone through interviews with a bunch of companies and now have a full-time job at Palantir! The subject of this post is on a puzzle I wasn’t too involved in and therefore have been putting off writing about. Like I said, bad excuses. That being said, you’re probably here to read about my Ditch Day stack, not about why I haven’t provided you with more reading material about my Ditch Day stack. It’s time to ramp up for the exciting climax. The frosh are back to the current time and meeting up with Kurt to go retrieve the time travel core in the Syncrotron lab. 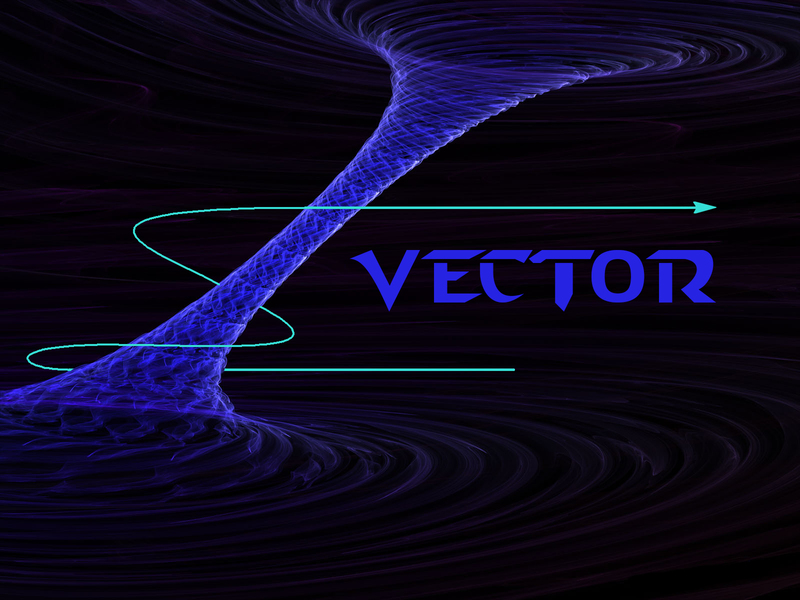 When they arrive to the lab, they find a large housing stamped with the Vector logo, on which they can climb and walk around. There are many buttons and switches all over the housing (many more than there are frosh). Kurt explains to the frosh that they have to perform a complicated security override procedure to open the housing containing the core. This procedure is much like a password, and Kurt already has the answer to the puzzle. It’s a sheet that details which buttons are to be pushed down at each time-step (which were about 10 seconds apart) and which position each switch was to be in at each time-step. If anything is wrong when it is checked, the frosh are taken back to the last checkpoint (there were checkpoints after the 3rd and 6th rounds). Since there were so many switches and buttons, the frosh once again had to determine the most effective strategy to cover each switch. I can say, since I got to experience the puzzle afterwards, that it’s a lot of fun, actually. This puzzle took groups approximately 30-45 minutes to complete. After completing the puzzle, an alarm sounded, announcing the fact that the security override procedure had completed and that the core was free to be retrieved. This is where the Grand Finale began (to be detailed later–ooh suspense). Video of the puzzle in action. The buttons were the same type used for our Mirror Maze. The switches were just handed to us by an alum who was two years older than us and happened to have a bunch of them sitting around (I think because he bought them for his own stack and never used them). The whole puzzle was powered by a Teensy++ 2.0, effectively an Arduino board with more inputs. Jeff had to spend far too many hours soldering the many wires to the board, and it kind of looked like a terrible centipede afterwards. We actually managed to sell off the board for a decent price after Ditch Day based on the fact that the next person wouldn’t have to spend so much time soldering wires to it. The code was written by another alum, Patrick. The housing was built out of a combination of particle board and dance platforms we borrowed from Blacker. According to Jeff, the housing was made of three 4 ft. and one 8 ft. dance platforms bolted together and a 2 feet x 2 feet area 12 feet in the air. The entire structure was then covered in particle board. 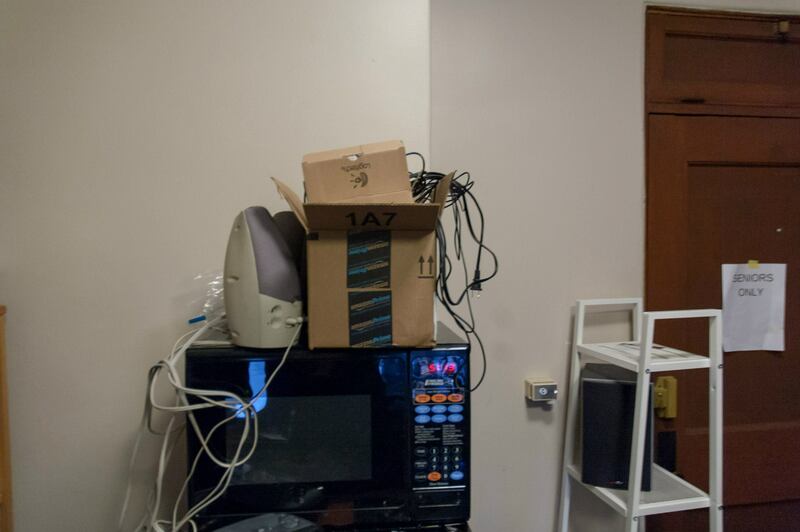 Fun fact about the housing: when we were reporting what we were doing to the powers that be (for safety reasons), we told them that our element would be a “box with buttons on it that the stackees would run around.” -shifty eyes- It’s okay, because we made sure the structure was safe anyway. The folks in charge of the Syncrotron lab definitely deserve a huge shout-out here. Matt talked to the people in the physics department in charge of the lab, which is pretty much a large warehouse-like area on campus where physics experiments that need a lot of space live. That area contains a lot of really expensive equipment too. The Syncrotron people were not only extremely accommodating in giving us a huge area to build the housing for the core, but then also gave us a large side room that we used for the grand finale. Some people working in the lab were also cool with letting us use their crane. 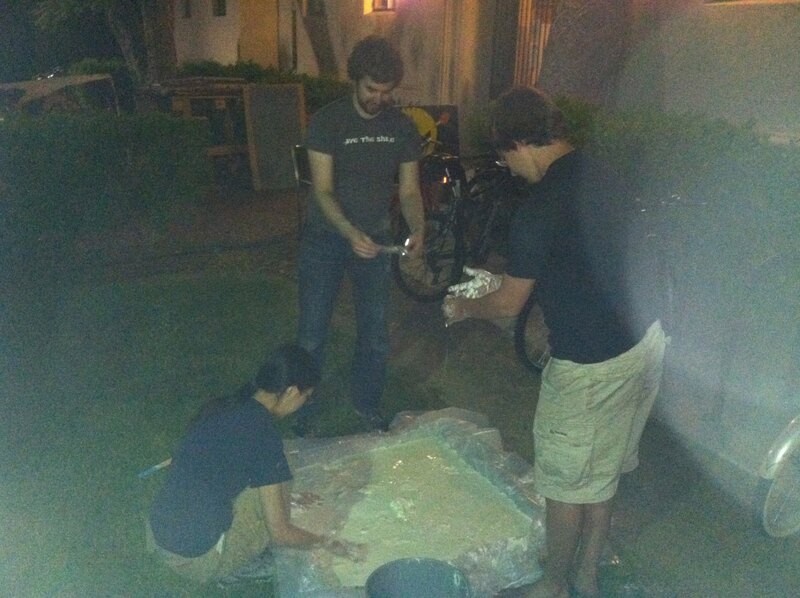 I think this situation is a perfect example of the Honor Code at Caltech having gone extremely right. Similarly to how I had been nursing the idea of the speaker puzzle for a while, Jeff and Matt had been discussing the idea of making a puzzle based on the board game Space Alert. In the game, you are given a sound track (on a CD or as an mp3) that tells you events that will happen at particular times (such as alien ships attacking yours). While that soundtrack is playing, you have to choose actions to do around your spaceship. If there is static on the soundtrack, it means communications are down and you cannot discuss what you are doing with your team for that small duration. Often times, you will find that your actions conflict with your teammates’, and thus you are tripping over ladders and not completing all the tasks you need to do and dying horrible deaths. We liked the idea of having a “puzzle-tivity”, where you had to figure out what to do, but executing the correct answer relied on getting timing correct. We also liked the idea of a puzzle where we “gave out the answers” at the beginning, and people getting mixed up and blocking each other while trying to scramble to do things. This is more or less how this stack element was born. It occurs to me that I forgot to mention one thing. As I said in my description of Ditch Day, the seniors are not allowed to be on campus during their stacks. How did we have video of our stack? We gave them a Flip Cam at the beginning of the day (along with the tablet) and told them to record their day. This was an idea stolen from the stack I went on when I was a frosh, and it was a great idea. The result is an amazing video reel of the happenings of the day. This is part 4 of a 10-part series. You’re our group of time-travelling frosh, ordered to report to the North end of the old Y building, because Vector Corporation has tracked the saboteur to that location. The Artificial Intelligence tells you that it can sense some strange signatures coming from the building, almost as if there is a time machine active there. You open the door and find that it is pitch black inside. From the little bit of light streaming in through the still-open door, you see signs that instruct you to remove all of your belongings and place them in the “magnetically shielded” (cardboard) box, as there are heavy magnetic fields in the area. You’re also given a very dim, blue keychain flashlight in another box. You have no idea what’s going on. That’s an abbreviated video of a typical experience through the mirror maze puzzle. A typical group would take somewhere between 30 and 50 minutes to complete the puzzle/activity, from walking in to finishing. As there isn’t any video of our actual stack going through the puzzle, I took this video during one of the many repeat runs we did during the weekend after Ditch Day (Matt and I liked to joke that we felt like theme park ride operators). The actual layout of the puzzle was a large maze with mylar walls (we easily bought 10-12 rolls of mylar for this and our other main puzzle). Inside the maze, there were 10 speaker buttons (Ultimarc GoldLeaf pushbuttons next to a computer speaker) and 10 “light-up” buttons (Ultimarc ClassicRGB LED buttons which lit up when they were active). The first button was always a speaker button that was near the door (to ensure that the groups would hear the first one rather than being confused for a long time), and the rest were played in a randomly chosen sequence. Whenever a speaker played the high-pitched “bomb noise” or a light-up button lit up, someone would have to press the associated button within the specified time. Note that there were twenty buttons but only about twelve people, so they had to be fairly efficient in covering the rather large space. The beginnings of the mirror maze. Note the markings on the ground denoting future maze walls. Those were…mostly followed. Getting to observe groups solving this was great, because you could actively see learning occur. In some order, the groups had to realize which buttons to press (the ones that were beeping or lighting up), that there was a back room that was hidden by a door screwed into one of the pillars in the room, that there was no set order to the buttons so the group had to manage to cover all of them, and the best strategy to cover all of the buttons. At first, the group would spend its time shouting and trying to figure out the best strategy. By the end, they would work in near complete silence, as you can see in the video. The door blocking the way into the back area. Most groups took a while to realize this was a door. The puzzle grew out of an idea I had been toying around with since I had been a sophomore. One of my favorite puzzles on my frosh year stack was one in which we had to push buttons near speakers that played the Ride of the Valkyries (something that is “forbidden” to play at Caltech except during finals week, and can cause strong reactions from students) to stop them. I wanted to do something similar but somehow top it. My original idea involved having speakers lining a very long hallway and having the frosh chase their own voices down (fitting into the time travel theme). One of Jeff’s ideas for a puzzle was to riff on the scene from Skyfall where James Bond is in a room at the top of a skyscraper with lots of reflective windows, trying to fight a bad guy. You can sort of see how that eventually became the mirror maze. So, how do you drive this puzzle? Most of the code was actually code from the puzzle on my frosh year stack, generously given to me by Andy Matuschak. Most of the logic was written in Ruby, with the sound part regulated by mplayer (did you know that you can arbitrarily select what channel to run a sound out of in mplayer?). I added in the part that drove the light-up buttons, which were driven by the pacdrive utility connecting to an Ultimarc Pacdrive board. The button input was processed by an Ultimarc I-Pac. In order to actually be able to plug all of the speakers into the computer, I had to put three 5.1 surround sound cards into it (one that happened to be lying around from my frosh year, and two that I had to buy)! It’s hard to sell off sound cards to people these days. For the wiring, we made the decision to cut costs by purchasing magnet wire. Upside: Incredibly cheap, given that our rough estimates for amount of wire required for this activity was about 2400 feet. Downside: Jeff spent many, many hours having to work on the wiring. It turns out that the best way to strip away the enamel insulation on the wires is to burn it off, which is a rather painstaking process. Only kind of a burn hazard. Also, the building we used for the mirror maze puzzle (and also another puzzle) had actually been abandoned for a few years. There was actually a lot of cleanup work that we had to do when we first got in there. 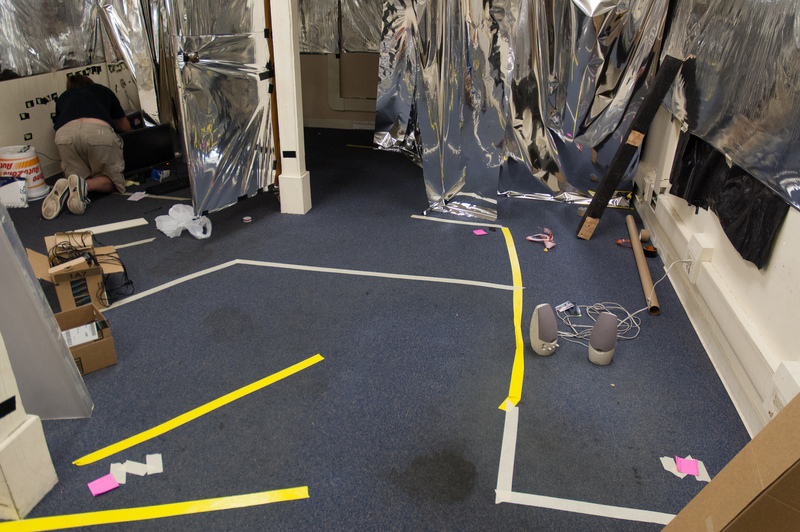 The mylar was attached directly to the ground and ceiling with gorilla tape (which we discovered was much more structural than duct tape — if you ever need to hold things up, seriously don’t buy duct tape) and then staple gunned to the carpet and ceiling. We were told we could make minimal structural damage to the building because it was slated for demolition soon anyway, so we had some fun with that. The funny thing is that that building had been “condemned” since we had been sophomores, so we were sort of dubious about this whole demolition thing. Apparently they had a demolition permit for the month after Ditch Day, though. I haven’t been back on campus to check if they actually followed through on it. Update: A friend on campus tells me that the buildings are still up. 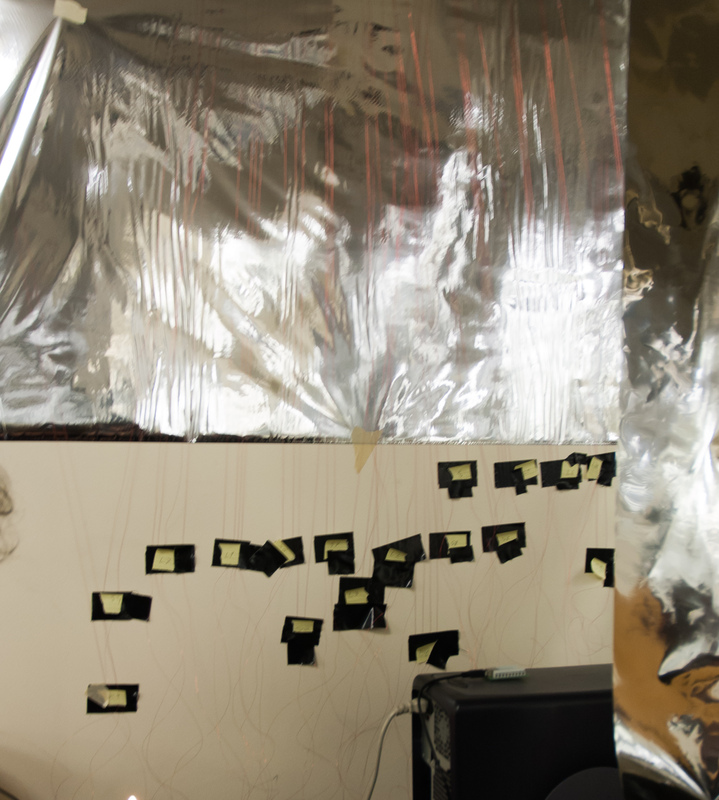 In order to ensure that the area was completely dark, even during the day, we actually taped some black plastic to the windows underneath the mylar that ran all along the outside walls. I spent a very long time trying to lightproof the room (as usual, 90% of the effort went toward 10% of the effect), which was hard to verify because during Ditch Day construction, our schedules had shifted to be nearly nocturnal. All the wires leading to the computer, with labels. I called it “modern art”. 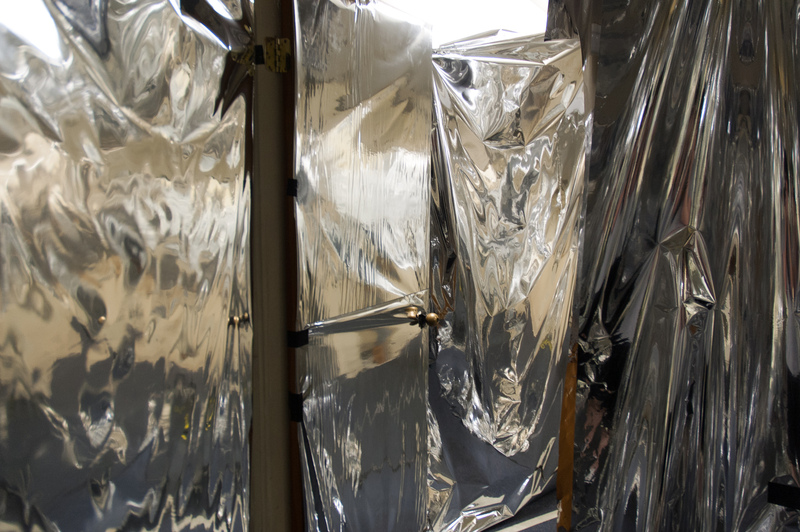 The mylar turned out to be a great choice for the overall effect of the room. Due to the fact that it was so thin, it actually moved around as you walked through the maze. This is pretty creepy when walking around in the dark. I had moments when I was working in the area in the dark, and the mylar moved around for just a bit too long as I was walking around (alone), freaking even myself out. The idea for using mylar came from a friend from the class above ours. We had reached out to our mailing list (which had seniors and recent alums on it) asking how we could easily get a lot of large mirrors (at that point it was still a literal mirror maze) cheaply. Our friend recommended mylar, which turned out the be the most economical option. Overall, this puzzle definitely took hundreds of man-hours of effort (thanks to all of the alums who helped us put up the physical components) and probably about $600-800 to build (between the electronic components, wires, mylar, and miscellaneous components like gorilla tape). It was entirely worth it, though, because everyone who went on it enjoyed it a lot and I think it was one of the main pieces of our stack that made it memorable. Hilariously enough, the only group we’d taken through the maze (out of like five or six) that didn’t actually complete the activity was the group actually on our stack on the day of Ditch Day, even though we had playtested it beforehand. Somehow, the first time they went through the maze, someone managed to turn off one of the speakers. The second time, they somehow decided the puzzle was broken (it wasn’t). Even the group full of drunk alums (who started out by pushing random buttons at first) managed to solve it (after sobering up a little). Next time, I’ll cover our other main puzzle: the “space alert,” or Synchrotron puzzle. It also took a lot of effort to build and I’m excited to share it, because it was equally cool. Unfortunately, I wasn’t quite as involved in its construction, so I probably won’t be able to provide as much detail unless Jeff has time to contribute.